US gap years are on the rise with more and more young American high school graduates grasping the opportunity to experience new cultures and equip themselves with valuable life experience. The statistics speak for themselves, with recent data from the American Gap Association (AGA) revealing that US gap year enrolment trends have almost quintupled since 2006. While the trend has been prevalent with European students for quite some time, it has only recently started to gain popularity in the United States, where young people are becoming increasingly aware of the social and self-development benefits associated with gap year travel. Defined by the AGA as "A structured period of time when students take a break from formal education to increase self-awareness, learn from different cultures, and experiment with possible careers,” gap year experiences can range in length from as little as two months to as long as the full calendar year. Popular pursuits include traveling, volunteering, interning, working or a combination of all four. Whether it’s before, during or after tertiary studies, gap years are an ideal way to broaden the mind, engage in cultural exposure, step outside the comfort zone and make new friends. Gap years also present an array of academic and future employment benefits, with 88 percent of AGA Gap Year graduates reporting that their experience had added to their employability and many others maintaining it helped them return to academic pursuits with a fresh new sense of purpose and focus. The unprecedented boom has seen a recent surge in the number of companies offering gap year experience packages to young US students. Unfortunately, many of these are unorganized, socially irresponsible and designed with the sole purpose of making a profit. As such, prospective gap year goers are advised to exercise ample caution when choosing a gap year provider. 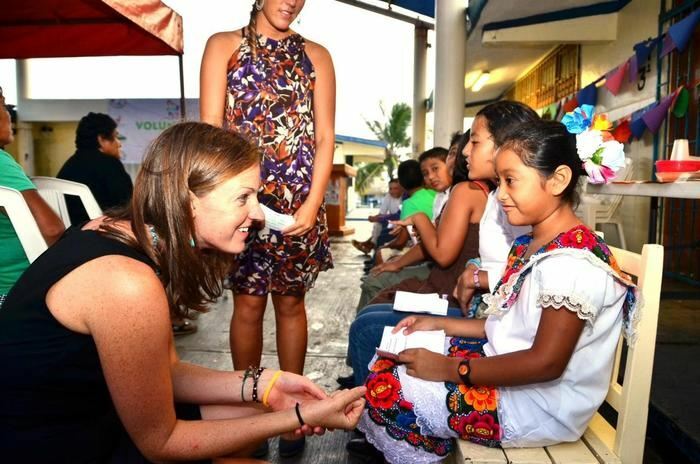 VolunQuest is a fantastic example of responsible volunteer tourism, the reputable company offering a series of exclusive cultural immersion packages to Mexico’s beautiful Isla Mujeres municipality. With over 30 years of experience working with the local community, VolunQuest offers US and UK English teaching volunteers the chance to engage in an authentic cultural experience while working alongside community stakeholders in a safe, secure and supervised environment. Isla Mujeres boasts crime rates lower than most small towns in the United States, making it a safe choice for those considering a gap year. Unlike the majority of other volunteer English teaching projects, VolunQuest works directly with Mexico’s Ministry of Education to provide the local primary schools of Isla Mujeres with a free and structured National English Curriculum programme. Projects are constantly overseen and supervised by company officials, which makes VolunQuest the only opportunity of its kind where volunteers can train in an accredited school system, gain authentic teaching experience and work from an internationally recognized curriculum. As a company dedicated to running a responsible volunteering program, VolunQuest also offers training and supervision throughout the entirety of their trip. This includes access to teaching materials, school supplies, office machinery and Wi-Fi connection which ensures that both students and teachers are getting the most out of the specially designed language programs. Upon completion of a VolunQuest program, participants are presented with an official Ministry of Education certificate confirming their training and stating the number of completed teaching hours. This certification is unique to VolunQuest and represents a highly valuable asset for students to utilize in their future professional and scholastic endeavors. VolunQuest is able to accept high school graduate as young as 17 years of age into its range of community enriching projects. With homestay accommodation, 24 hour emergency support, administration fees, meals and orientation included as standard, the company is the ideal platform for young Americans to engage in a safe and structured international volunteer tourism program. Please direct press queries to Rebecca Appleton at Dakota Digital. Email Rebecca@dakotadigital.co.uk or Tel: 01623 428996. About VolunQuest: With over 30 years of experience working with the local community, VolunQuest has established a series of meaningful volunteer tourism programs with federal, state and local governments within the Mexican municipality of Isla Mujeres. In association with the Ministry of Education, students from the UK and US are offered the opportunity to teach English to public primary school students in an environment that is safe, supervised and structured. There is also a selection of ecological projects available for students with an interest in environmental conservation.